Imagine you get to work and right after you sign in, you are given a packet of work to do. The packet includes an editing sheet of sentences where there are mistakes in capitalization and punctuation. It also includes an article to read with comprehension questions. You’ve been given no context for the article or time to talk with anyone to activate any background knowledge you have on the subject. It’s Monday morning and you are desperate to talk to your colleagues about something that happened over the weekend, but your principal says, “No talking- start your work!” and you have to sit in your chair and begin completing these worksheets. Would you feel welcomed? Would you feel joyful about the day and week ahead? Would your curiosity be sparked? Would this be how you choose to start your day of work? For many students, school begins this way. After unpacking, they are given morning work to do and it is expected to be done in silence. Some students have multiple morning worksheets to do. These are not authentic tasks based on students interests or passion. There is no choice involved in this work. No one sees it but the teacher who may or may not even check it. I realize that I’m most likely preaching to the choir here, that those of you who read teaching blogs each day most likely are not beginning your day like this. But you may have a colleague who has always done it this way and doesn’t see the harm in this type of morning work. Or you may have a child in your life who goes to school and is given a packet of work each day to complete. My hope is this post can be shared with educators who begin the day with worksheets to help them envision a different way the day can begin. In the book, The Curious Classroom, by Harvey “Smokey” Daniels, he writes, “When we begin handing out worksheets or spewing information the second kids walk through our door, are we contributing to what Stanford psychologist, Emma Seppala (2016) calls “toxic stress”? It’s worth considering what is really the best way for kids to begin their school day”(60). Daniels also states, “We don’t have to teach the whole class from the opening bell. The first chunk of the day/class can be personal choice time- quiet, industrious, and maybe even shoeless. When we let kids find their own way into the day, we activate their curiosity and sense of self-direction, mind-sets that serve learners well in the formal inquiries that follow” (59). Beginning the day with student-directed choices has become known as “soft starts.” Chapter 4 in The Curious Classroom is dedicated to this topic of beginning the day with “not rigid, but gentle, individualized, and peaceful beginnings, driven by personal choice, not ordained by someone else’s agenda or requirements” (61). Aliza Werner, a friend and fellow third grade teacher in Wisconsin, has dubbed her soft start as “Spark and Shine.” Her students begin the day with many different options including building, painting, reading, writing, and creating. Aliza has shared with me that she will never go back to any other start to the day. Our conversations have helped me think through how I can implement more of a soft start in my classroom with creative options for students. While there are many reading and STEAM possibilities for a soft start without worksheets, I will focus here on ways to use writing to ease your students into the day, while exciting them about their learning and sparking creativity. Not a worksheet in sight! Card-making station: Students often come into the classroom, letting me know it’s a parent’s birthday or a sibling’s special day. Sometimes they talk about a wedding they went to or they let me know someone in their family is sick. Making cards for people in your life is an authentic and purposeful way to begin the day with writing. There is a real audience and a real need to get the message right, to punctuate, to spell words correctly. It also encourages kindness and thoughtfulness. Digital writing: My students love Buncee and enjoy writing poems, stories, and sharing information on this platform. Students can also share their ideas via Google Docs and Slides. Free writing: Paper and pencils are sometimes all that is needed for a student’s creativity to shine! Last year, one of my students created a character that he featured in over 20 books he wrote over the course of the year. Giving students the time and materials is sometimes all that is needed for a student to develop a stronger writing identity. Wonder Journal: Each day, my class shares a fact of the day. I find most of these facts on the Snapple website. Students can use the fact of the day to inspire questions or they can write about anything they are wondering about in a Wonder Journal. (This could be digital or a real notebook). Inspiring Quotes: In addition to a fact of the day, one of our class jobs is the Chief Inspiration Officer (CIO) who selects the quote for the day. Students can read through inspiring quotes and copy down one that inspires them. They can illustrate it and create their own quote collection. I have the 365 Days of Wonder: Mr. Browne’s Precepts by R.J. Palacio and have printed some motivational quotes and placed them in a binder. We share them each day here. Word play games: Growing up, I loved games like Boggle and Scattergories. Students don’t always have experience playing board games. This could be a fun option to build vocabulary and also learn the social skills involved with taking turns and winning and losing. Book reviews: Students can write a script for a book review and then create a video review. This can be shared on Buncee, Flipgrid, or Padlet. Other digital options for book reviews could be a class Google Slides, a Padlet, or a blog post. If digital options aren’t readily available, you can have students create a review on paper and place them in a binder near your classroom library. Blogging: Many teachers worry that blogging will take a lot of class time. The truth is, blogging doesn’t really take much instructional time after it is initially taught and launched. For me, blogs are a place for students to share their stories whenever they can. This can be outside of school or during free moments in the classroom. Morning time is the perfect chance to share a story from your weekend or something on your mind by blogging about it. For more resources on blogging with your students, check out posts I’ve written about blogging: Diving into Kidblogs and Make your Mark By Blogging. I think presenting many different options over time and allowing students to follow their interests is key. This is not about assigning students to a specific station and forcing them do the work there. It’s showing possibilities and then allowing students choices in what they select. It’s fostering self-identity as a writer by allowing students the opportunities to write what is meaningful for them at the start of the day. Smokey Daniels posits, “Looked at over a whole day of school, a fifteen-minute soft start is an investment in the overall seven hour outcome. Kids will accomplish more ‘net learning’ if they start that day in the driver’s seat.” (77). 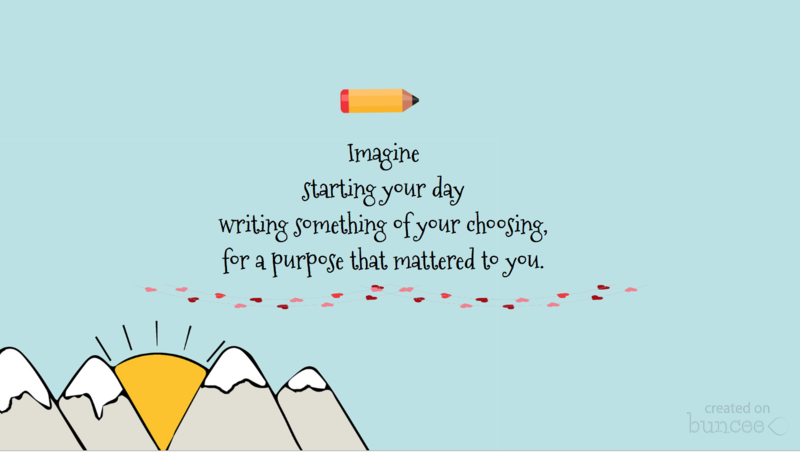 Imagine how different you would feel starting your day writing something of your choosing, for a purpose that mattered to you. Imagine how collaborating with others on a project might energize you. Teachers, give up the old worksheets! Save yourselves hours of photocopying and checking papers where kids joylessly fix errors in punctuation and capitalization. Drudgery has no place in our classrooms. Let kids write and create for real reasons and purposes and let it begin at the start of the day! Our new co-author, Kelsey Corter, wrote Please Stop the Morning Work on her personal blog, Small Steps. Last week, I wrote What Does Morning Work Look Like? on my personal blog Courage Doesn’t Always Roar. (You can see this topic has been on my mind!) The comments were helpful and full of good ideas. How have you used writing to create a soft start for your students? Please share your ideas in the comments! Following our Morning Meetings, my best days with my students begin with Buncee. I love it and so do they! My students love creating Quote for the Day, Word of the Day, National Holiday, and Create Your Own Buncees. We have a blast! What an awesome idea. On my do list for next year! Morning work feels so out of synch with what is best for kids. After all, as grown-ups in the workplace, we aren’t asked to come in, immediately remove our coat, sit down, and work! I did some softer starts with my fourth graders towards the end of my time in the classroom. You can read about them by going to https://twowritingteachers.org/2008/03/19/coming-soon-poetry-station-for-morning-work and https://twowritingteachers.org/2008/03/21/poetry-station-ready-for-lift-off/. Mornings were so much more mellow once worksheets were removed and meaningful choices were given. You have a book in this post Kathleen….seriously! Nobody should feel comfortable starting the day with a worksheet. I love your list of ideas….card making is my favorite! Your ideas all fit with authentic, purposeful learning. Yes, yes, yes! These are the conversations we need to be sharing! Lisa has a good point, Kathleen (about that book). Kathleen, this post is so great! Offering meaningful choice within the confines of a learning day can reap so many benefits, both for student engagement, mental health, and educational spirit. You list so many excellent options here! This article from Jennifer Gonzalez https://www.cultofpedagogy.com/busysheets/ from a few weeks ago got me thinking about morning routines and what I expected of kids as they come in and get ready for the day each morning. In my 4th grade classroom we now have Morning Choice with a board of choices on the screen each morning. The kids have loved it and everyone is happier to start the day. I have included writing, collaborating, problem solving, finishing work, reading, art, games, legos, coding. etc. I was so happy to read this post and send it to my teachers to reinforce what they are doing. PK, Kinder, and First Grade classrooms all start with ten minutes of exploration time when the students walk in. The teachers put out several options each morning and students make choices in how they want to transition into their school day. There are often options to build, create, read/write, or just play. From there we go into a short morning meeting and then the students are ready for academics. The addition to exploration time has been beneficial to everyone! I have had the privilege of starting every Friday morning in 5th grade classroom for what we call Journal Pages. We simply offer children choices for what they would like to explore to start their morning. We often use the Daily Writing Habit’s Word of the Day as one choice and copying an art card as another choice. We’ve woven in other choices – observing objects through line drawing and writing. Observing what you see outside in words and pictures. It is the simplest and most calming way to start the day. The children get to explore their ideas and thinking through words, pictures, and art all the while feeling empowered and open to discovery! LOVE you post! The timing of this post could not be better. It is absolutely inspirational. I can’t wait to share it with colleagues at my school. My 1st graders start their day with writing in their gratitude journal and then choice time – legos, blocks, arts & crafts, puzzles, games. So do choose to write. Some read. And a few will ask to research or play games on our iPads. It’s a great time for them to chat with friends and ease into the day. And a great time for me to observe decision making and problem solving in a social setting. So much learning happens in these 20 minutes. While we didn’t have the silence per se, we did have DOLs and math pages across the building. The change moved across the building over the last two years. Now bins of coding, math manipulative, collaborative work have replaced all of that. What a positive change for students and their teachers. I’ll share this post with hopes that your ideas will be integrated too. Love the board game idea!